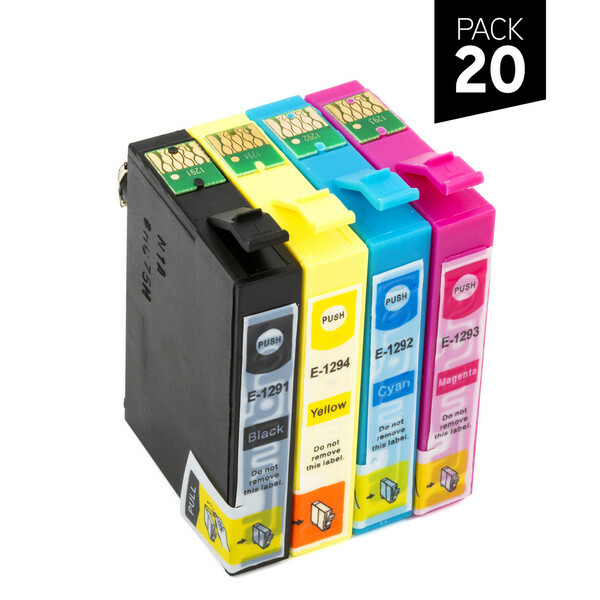 Pack de 20 cartuchos genéricos ZP-Epson T1291+ T1292+T1293+T1294. Serie SX: Epson Stylus SX420W SX235W, Epson Stylus SX425W SX430W, Epson Stylus SX440W SX445W, Epson Stylus SX525WD, Epson Stylus SX535WD SX620FW. Serie Office: Epson Stylus Office B42WD, Epson Stylus Office BX305F, Epson Stylus Office BX305FW, Epson Stylus Office BX320FW, Epson Stylus Office BX525WD, Epson Stylus Office BX535WD, Epson Stylus Office BX625FWD, Epson Stylus Office BX630FW, Epson Stylus Office BX635FWD, Epson Stylus Office BX925FWD, Epson Stylus Office BX935FWD. Serie WorkForce: WF-7015, WF-7515, WF-7525.